Are Scanned Documents Legally Accepted? When considering your organization’s compliance, record keeping is often a top priority. In fact, many organizations hold on to documents longer than necessary (or may not even know how long they’re supposed to keep documents in the first place) meaning that the stacks of files just build up. Businesses looking to reduce their paper pile may desire to migrate their files to a digital database but are wary of the legalities of the process. What are the rules of records management, and most importantly, are scanned documents legally accepted? 1. The Uniform Photographic Copies of Business and Public Records as Evidence Act (UPA) (US 1128‐0020‐00) ‐ Enacted by almost all states, it specifies that reproductions of records have the same legal significance as the original and may be used in place of the original for all purposes including evidence. What does this mean? In short, it means that copies, microfilm, and other reproductions, documents are the same as physical documents and are just as legally valid. What does this mean? It means that as long as your digital duplicates are the same as the original (which with the proper processes and procedures they would be), you can utilize them in U.S. Federal Courts and the majority of state courts. Both laws state that duplicate records may be admitted into evidence if they accurately reproduce the original. Because document imaging technology is a duplication technology similar to physical reproduction methods such as photocopies, microfilm, and facsimile, digitally stored documents fit within these regulations. What classifies as a reproduction? Image Capture ‐ A photographic, scanning, or another process that identifies and captures the image of the original document. Image Manipulation ‐ A photographic, electronic, photostatic, or another process that transforms the captured image into a format for storing and reproducing the image. Visible Reproduction ‐ A photographic, photostatic, printing, or another process that converts the manipulated image into visible form. A document imaging system, for example, utilizes an electronic scanner for image recognition, computer software, memory and optical disk storage for image manipulation, and graphic terminals and laser printers to make the image visible. 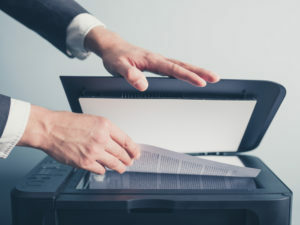 A document imaging system is similar to other reproduction technologies in that a document imaging system utilizes an electronic scanner for image recognition; computer software, memory and optical disk storage for image manipulation, and graphic terminals and laser printers to make the image visible. As long as it’s correctly done, courts have upheld that imaging and scanning are just as legally binding as paper documents. Legal acceptability of scanned document images depends on the process used to create the documents. Regardless of how you store your documents, audit trails are recommended in order to prove that a transaction was properly processed by the organization. With an audit trail, you can instantly know every time an electronic document has been viewed or manipulated. Audit trails help ensure document integrity and prove that the image is a true representation of the original ‐ reducing exposure to risk. In the United States, records made from a document imaging system will be admissible in evidence to the same extent as the original record, as long as the document imaging records accurately reproduce the original. If that standard has been met, an organization can feel secure in destroying the original records and relying on digital records as evidence. Similarly, records required by government agencies can be maintained in document imaging systems. Whenever the government agency requests information, the organization would prepare duplicates from the document imaging system. The government agency may require that original records be kept or that your document imaging system meet certain standards. Government agencies in the United States may also use document imaging systems to manage and retrieve information. Original short‐term paper records could be destroyed after the images have accurately been preserved in a document imaging system. Since document imaging records are not archival, long‐term (retention over 10 years) or permanent records must generally be maintained in either paper or archival microfilm form. It is not expected that state and federal archives will permit the destruction of long‐term paper records after scanning into a document imaging system, even when document imaging are certified for archival purposes.